The Great Wall of China still confounds visitors more than 2,000 years since its construction began. It is said that the Great Wall of China is one of the few manmade structures that can be glimpsed from space. There is an ounce of truth in this, but it is mostly myth. At low orbit, the wall can just be delineated, but from higher up, let alone from the moon, this is an urban legend. It is nonetheless understandable how the belief has spread over time: the wall is mind bogglingly large. Known as the “long wall of 10,000 Li” in Chinese, the hulking edifice runs more than 8,850 kilometers – longer than the previously thought length of 5,500 kilometers – across the northern Chinese frontier at the southern edge of the Mongolian plain, from Hebei province in the east to Gansu province in the west. Its total length, including all offshoots and branches, extends more than 20,000 kilometers. Although the wall is one solid monument in the popular imagination, the reality is a bit more complex. Built in fits and starts from the 3rd century BC to the 17th century AD with bricks and stones, and packed with earth and even wood, the Great Wall has become a landmark synonymous with China. Although the wall is renowned for its architectural triumph as much as for its historic importance, its construction was a practical affair. It was built in stages by various dynasties, beginning with Emperor Qin Shi Huang of the Qin Dynasty (221-206 BC), who ordered millions of people – soldiers, workers, slaves – to build the wall in an effort to quell nomadic Mongol warriors. The wall continued to evolve until the Ming Dynasty (1388-1644), which erected the more modern sections most think of as the Great Wall today. Regardless of who or when each bit was built, there was continuity – the Ming built from where the Qin left off. Dotted with strong fortresses both on hilltops and ridges. Transforms into dancing dragon in earth’s hilly forest. The arduous task of building the wall unfortunately did not pay off in the end. It proved to be far from impenetrable. At its tallest, the wall’s height reached 25 feet (7.6 meters), was as wide as 15-30 feet at its base and 9-12 feet across at the top. It was punctuated by watch towers, shelters and tracks for horses and troops. Yet, it was interspersed with gaps through which Mongol raiders routinely passed. For this reason it was ultimately not a success and was left unfinished. Regardless of its success as a fortification, word spread of the wall’s existence as contact between China and the West increased in the 17th-20th centuries. It was during this time that the legend was created. In the 18th century, English antiquary and field archaeologist William Stukeley penned a letter that planted the seed of the conjecture that it was visible from the moon. More outsiders came to visit the structure in the 18th and 19th centuries – the usual suspects: European explorers, from traders to Jesuit priests. This outside interest culminated in extensive restoration and rebuilding in the 20th century, when the wall took on a new role as cultural ambassador. It was recognized as a UNESCO World Heritage Site in 1987, and along with India’s Taj Mahal, is listed as one of the New 7 Wonders of the World. Although there have been issues with unsustainable tourism and even vandalism to the Great Wall, it isn’t going anywhere. 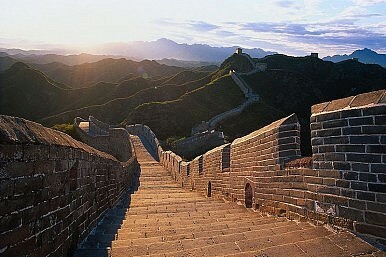 Today a popular 50-mile stretch of the wall near Beijing attracts thousands of tourists daily. People run marathons along the wall, with its dauntingly high steps, and are gradually getting the chance to explore stretches of the wall that were previously out of reach for tourists.